In 2007, Fiete Stolte broke with the generally-accepted system of hours and days by living an 8-day week with 21 hours per day. To prove that eight days can fit within a week, he travelled around the world and photographed eight sunrises in seven days. Like the Russian revolutionaries who tried to abolish Sunday through a 6-day week, Stolte recognized the political potential of standardizing time and the determination of one’s own life that results. His Inverted Clocks don’t show the time, rather the flip side of the respective time, thus pointing to the impossibility of a visualisation of time and uniting presence and absence. 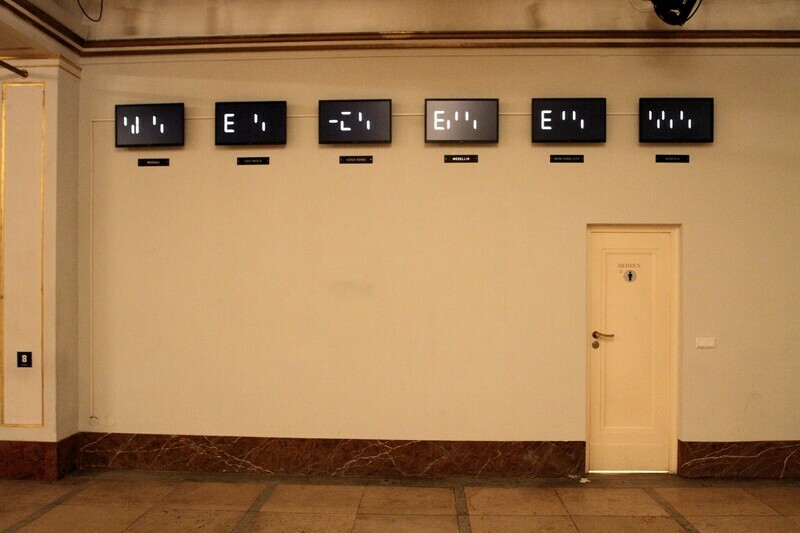 The names of the six cities, installed as signs below the clocks and arranged chronologically, refer to exhibitions of Fiete Stoltes work in these places. Fiete Stolte, born 1979 in Berlin, is based in Berlin. His works have been exhibited in several international galleries and museums including Moscow (2012), Sao Paolo (2012), Medellin (2013), Taipei (2013), Hong Kong (2013), New York (2017) and at the 57. Biennale di Venezia (2017).